PTFE Teflon® Graphite Packing : PTFE Graphite Packing, Hollow Core Gland Packing, 100% GFO Gland Packing, Carbon Gland Packing, Pure Carbon Gland Packing Manufacturer in India. 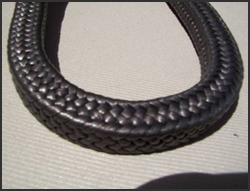 PTFE Teflon yarn coated with graphite and lubricated with an inert high temperature lubricant. Less gland adjustment, easy break-in & even compression in all rings. Six times better heat conduction as against pure P.T.F.E packings at comparatively high speeds. Significantly low thermal expansion thus resisting 'over expansion' extrusion under service. Acids, alkalis, solvents, hydrocarbons, inorganic chemical handling equipments. Steam valves, metering pumps, reactors, mixers, autoclave glands.